What is the mass of neutrinos? To answer this fundamental question, the KATRIN experiment was designed and built by an international collaboration at the Karlsruhe Institute of Technology. On June 11, 2018, an international symposium marked the beginning of data acquisition. The first electron spectra from tritium decay have been analyzed with an analysis chain developed at IRFU. Everything conforms to the required specifications and the first long data taking campaign for physics can start. First results expected in 2020. It's only in the last two decades that we have known that neutrinos have a non-zero mass. This breakthrough is due to the discovery of neutrino oscillations by the international teams of Professors Arthur McDonald and Takaaki Kajita, who were awarded the 2015 Nobel Prize in Physics. However, these discoveries do not tell us what the mass of neutrinos is! This mass could be the key to understand the nature of these particles as well as the large structures of our Universe. Figure 2: Complete electron energy spectrum of tritium (left). KATRIN studies the shape of the spectrum in the distribution tail represented for neutrino masses of 0 and 1 eV (right). The principle of direct measurement of neutrino mass was stated by Fermi: the decay of tritium releases an electron and a neutrino, which share the decay energy of 18.6 keV. In extremely rare cases the electron carries almost all the available energy. The undetected neutrino therefore only carries its rest mass energy , which then subtracts itself from the electron's energy. This tiny amount of missing energy in the electronic energy spectrum is searched, down to a level of 0.2 eV, corresponding to an incredibly low mass of 3.6 x 10-37 kg! Layout of the KATRIN experiment. The tritium source is housed inside a 16 m long cryostat (left). The electrons are guided by powerful superconducting magnets to the very large electrostatic spectrometer (right). A pumping system ensures that no tritium enters the extreme vacuum of the spectrometer (medium). The electrons are counted by a silicon detector located 70m from the source (far right). Image: KIT. 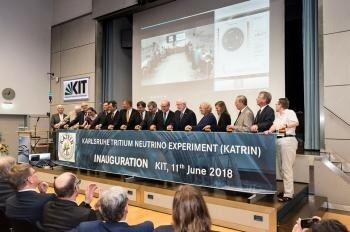 Direct measurement of neutrino mass is the goal of the KATRIN experiment at the Karlsruhe Institute of Technology (KIT). The KATRIN collaboration, composed of 200 members from 7 countries, is taking up the technological challenges of determining this tiny mass in the laboratory. IRFU contributes through the realisation of a simulation and data analysis chain for experience data analysis; the development and implementation of an electronics readout for future detector upgrades; but also by ensuring complete testing of large superconducting dipoles. In May 2018, a high-purity molecular tritium gas was injected for the first time into the experiment. 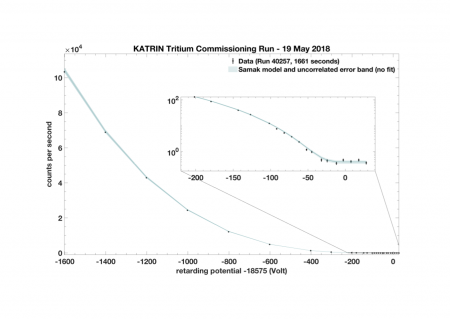 Energy spectrum of tritium following the first data taking of the KATRIN experiment. The data (points) are compared to the SAMAK code, developed at CEA/IRFU, which models the ß decay and the entire instrument. The green strip illustrates the systematic uncertainties calculated by the SAMAK code for this technological run. Image: Thierry Lasserre, CEA. 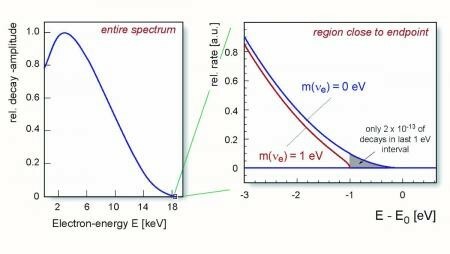 The first ß-spectrum of tritium was analyzed by an analysis chain of analysis developed in collaboration between CEA/IRFU and, Max-Planck für Physik and the University of Munich. From the very first runs, the agreement between the modeling of the instrument and the data was remarkable. In total, about several hundred million electrons were recorded. At this stage of the analysis, presented at the Neutrino 2018 conference, the very strict stability requirements, at the 0.1% level, have been validated. After a final calibration phase, 2019 will mark the first long physics data taking campaign. First results are expected in 2020. They will be followed by the search for the existence of light sterile neutrinos (m ≤ 1 eV) which could also alter the shape of the energy spectrum. It is worth noting that the sum of the masses of the three neutrinos is also particularly well constrained by cosmology (see for example this highlight). The comparison of these measurements with fprthcoming KATRIN findings, independent of any modelling, will undoubtedly reveal the last unknown mass of the standard model.